Allergan products purchased by our Modesto Botox Practice in 2014. Allergan has a robust reporting system which can track your purchases throughout the year. The graphic below represents the amount of Botox, Juvederm Latisse, Voluma and breast implants purchased from Allergan over the 2014 year. However, not all these products were delivered in 2014. It is possible that some of these products have a “scheduled” shipment in 2015. Natrelles listed here are breast implants. There are other companies which sell breast implants, such as Mentor. Mentor is the maker of the memory shape implant and is a competitor to Allergan. In our Modesto Plastic Surgery practice, we carry a whole array of Mentor breast implants and have at our use many Natrelle implants. In 2014, 365 bottles of Botox were purchased. As for the Juvederm Ultra and Juvederm Ultra Plus and the Juvederm Voluma – those are boxes of the product. There is more than one syringe in a box. More on this topic another day. As for the Latisse, it is in cases – many many Latisse boxes in a case. Please feel free to visit us in Modesto. I don’t have this 100% verified. But I heard a whisper about this as I am a regular Modesto purchaser of Botox, Juvederm, Voluma and Latisse. I heard that across the board all these three products are going up in price in January except the 5 ML Latisse. I do recall that last January, Botox had a sudden increase in price which wasn’t announced ahead of time. I think Botox practices deserve to know ahead of time for planning purposes. I remember when we started purchasing Botox in 2006 that every year, the price would go up. To our humble Modesto practice, it felt like a bit of a struggle to keep up. When the recession became more of an accepted ambiance, Botox prices stayed the same for a few years. But starting in 2014, the prices started increasing. I had a strong feeling that many practices in Modesto, including ours had greater temptation to migrate over to Xeomin and Dysport from Botox. However, I think as with inflation, there tends to be an increase in just about everything all the time. How much would Botox Cost at our Modesto Practice? I think we would consider following the trend of price increases. If our Botox source goes up 3%, we would probably consider following. However last year when Botox price increased for us, I elected not to increase our Botox price for patients, yet. Please call our office for the latest information. Our phone number is on our Modesto Website. Hopefully Botox’s prices doesn’t skyrocket to the point where we have constantly diminishing returns. Diminishing returns? There is pressure, naturally, to lower the price of Botox for patients – there’s competition from other injectors, there’s fake Botox, there’s Botox from other countries, and their’s other products that do similar things to Botox such as Xeomin and Dypsort. Enter Xeomin and Dysport into the Modesto market? Belotero and Radiesse? In general, it’s good to keep an open mind about the possibilities of other products that work in the same areas as Botox, namely, Xeomin and Dysport. I already like a lot of Non-Allergan products – meaning non-Juvederm. My personal exploration with these other products were brought about in the early 2014 price increase that was suddenly dropped on me in January 2014. So good things come out of things that appear bad at first. I think I wouldn’t have been such a supporter of Belotero – Belotero Balance – if I didn’t have a kick from the sudden jolt that I received from Allergan in January 2014. Getting Botox injected into one’s glabellar complex or crows feet has always been a choice, not a right. Thus we can simply choose to avoid this price increase by avoiding Botox altogether. That could be a choice for the consumer, or it could be a choice for the Botox injector. For a cosmetic surgeon, there’s a choice to focus more on surgeries. We can’t complain, as a team, my wife and I have had the opportunity to do many cosmetic surgeries. In fact in 2014, we were voted Best Cosmetic Surgeon in Stanislaus County (which includes Modesto) from Contentment Health Magazine. But I’d like to think that I’m trying to keep the prices reasonable for our patients in Modesto, CA. How much does Botox cost in Modesto? update: There is probably going to be a price increase in 2015 for Botox. Please call our Modesto office for the new pricing. As of the initial writing of this Modesto Botox Blog, we charge for cosmetic Botox $11.70 per unit. We used to charge $13 per unit, but then decided that our Modesto Botox practice wasn’t too keen on having specials which caused people to buy Botox on impulse – thus we decided to put it “on sale” all the time instead of having fluctuating/time limited specials. Thus the “on sale” all the time pricing was 10% off the $13 per unit. Last year, Allergan (the makers of Botox), raised the price of Botox, but we kept the price the same. We had some discussion of increasing our price, but as of this date we haven’t done that. Please contact us via phone to find out if our prices have changed. Regarding Botox Coupons? We do consistently take Allergan’s Brilliant Distinctions. This is run by the Allergan company. If they want to give you coupons to use – by all means use them! We have a slightly different charge for Medical Botox, as opposed to Cosmetic Botox. Our office in Modesto does not take medical insurances. 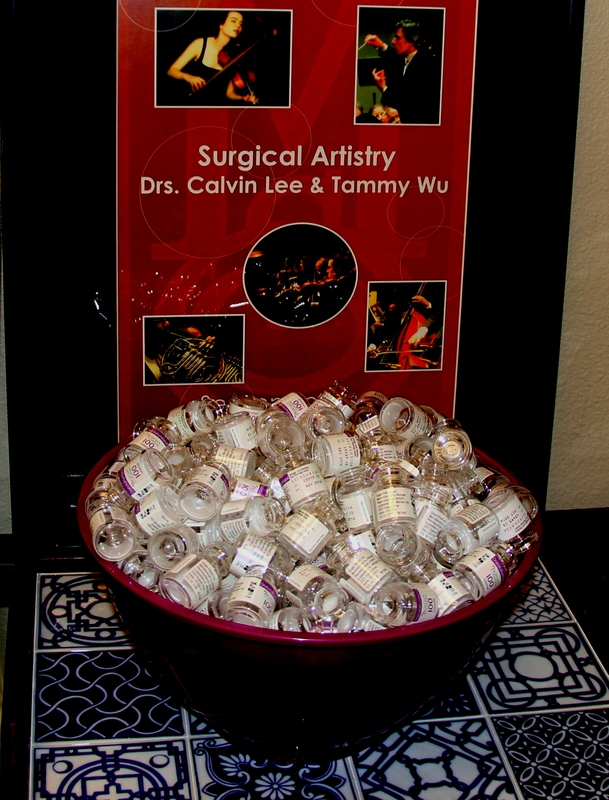 update: Starting April 2015, we raised the price of our Botox injections by Dr. Calvin lee to $12.00/unit. This is the first time we’ve increased our price of Botox since 2006. Please check with our office. It’s my believe that the cost of Botox will increase slightly every year. What is the average number of units received in our Modesto Botox practice? According to my 2014 Modesto Botox statistics, the average number of Botox units used by my Modesto patients is about 34 units of Botox. How much would 34 units of Botox cost in our Modesto office? What is the rest of the United States and other areas of Modesto charging? I’m not exactly sure. But I think it would range anywhere from $9 per unit to $15 per unit of Botox. Feel free to visit this link where I list about 40 places to get Botox in Modesto, California. How does Botox compare to the prices of Xeomin or Dysport? Usually Xeomin and Dysport is about 10%-20% lower in cost. Sometimes Botox is charged by the area. There are two areas on the face as of the initial writing of this blog where Botox is FDA approved for cosmetic use. The Glabellar Complex (area between the eye brows) and the Crows Feet. We don’t currently charge that way in our Modesto Botox office. We feel that it is easier to customize the Botox dose for the patients if we charged by the unit. We would say that the most common charge for the Glabellar Complex (area between the eye brows) is $234. And a very common charge for the crows feet is also $234. That translates to about 20U for each of these cosmetic facial areas for Botox injections. Summary of How much does Botox cost? Botox costs $11.70 per unit (please call our Modesto office to check with us to see if prices have changed). Update, the price has increased to $12.00 per unit (the first increase since 2006). Most of our Modesto patients get 34 units of Botox for cosmetic uses (on the face). Doing the multiplication, 34 units of Botox costs $397.80. But many people just get one area done for Botox and that could 10-20 units. Which would be $117 to $234 – if using our Modesto office pricing (Surgical Artistry). I think my front desk may often mention this – as a starting point for someone new to Botox. Please see your own Botox Surgeon, Botox Physician or Botox Injector regarding your personalized pricing. Feel free to visit our Modesto Botox practice. I also wrote another page about the cost of Botox about 1 year ago. Not much has changed. Check it out if you’re interested. There is no specific medical info here, please see your physician in person. 34,234 units of Botox injected & 443 syringes of dermal fillers implanted in 2014. Much of the data here comes from my own recording of each day’s usage of Botox. I have Jessica to thank for entering this data every day at our Modesto plastic surgery office, Surgical Artistry. By using these statistics, I am hoping that other Botox injectors will find them useful, and I will also use them to find ways to improve. Every Botox patient is unique and special to me – the statistics here is a look at my practice, not a look at an individual patient. But for me, to be an excellent surgeon, it is my belief that my best surgical outcomes come from consistent practice, a good volume of injections, along with diligent purposeful thoughts of improvement. Thus I keep track of many things in my practice of medicine. These statistics are just one of them. There’s a saying which I put to practice from my surgery residency days: “You can’t manage what you don’t measure.” Although the phrase was first presented to me as “If you can measure it, you can improve it.” I prefer thinking the second iteration. It just sounds more positive to me. Number of Botox visits to us in Modesto, CA for the year: 1009. This is up from last year where I had a total of 724 visits. (there were still 2 more days left in the year when this was written and compiled), so these numbers will be even higher. 503 different patients were seen for Botox in 2014. This is up from 374 last year. Average number of patients per month: 84 patients per month. Total number of Botox units used per year: 34,234 Units. Dermal syringes injected over the year: 443 syringes of filler! I had no data on this last year. I do not have data on which type of syringe was used (ie. Belotero, Voluma, Radiesse, or Juvederm). As before, about half of my time is reserved for Acupuncture. 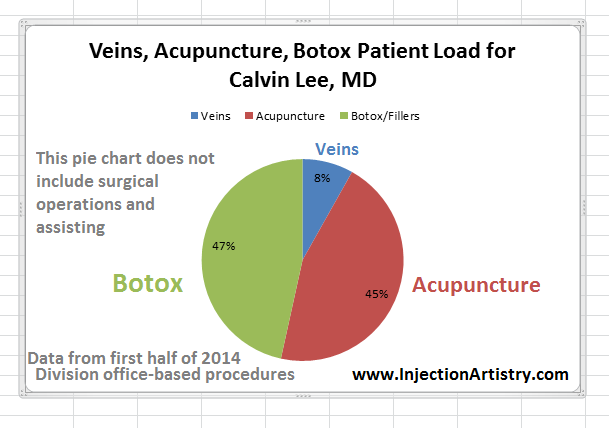 2014 data for how my Veins, Acupuncture, and Botox division of office based procedures. Surgery isn’t included here since it isn’t done in the office. This chart is just the division of my patient load in the office. Average number of Botox units used per session. Average number of Botox units used by patients per visit is 33.9 U.
I have a degree from Brown University in Neurosciences. I have a medical degree from Brown University. My main focus now is minimally invasive type procedures done with needles such as Vein Sclerotherapy, Acupuncture, Botox and Dermal Fillers in our office in Modesto – Surgical Artistry. Dermal fillers which we use are: Radiesse, Juvederm, Belotero, and Voluma. 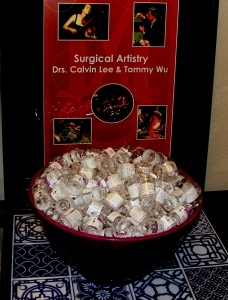 In one of our private waiting rooms at Surgical Artistry, I have displayed a bowl of empty Botox bottles used up in 2014. I’m happy to report that 503 patients helped me use up these bottles of genuine Botox over the course of the year. However, I have two more days of the year to go! My wife, Dr. Tammy Wu – Modesto Plastic Surgeon, says I am a hoarder (hopefully not compulsive). I am very thankful for all those who have trusted me with their cosmetic injections. The framed print in the back is from the Modesto Symphony Orchestra where we had sponsored a season. The tray is from the Bombay Company. This link shows the tray which can be purchased online. I will probably need new ideas on where to store these Botox bottles in the future. Perhaps it will soon be time to throw them out. Related link: How is Botox supplled? How is Botox Supplied in the USA? Botox is supplied differently in each country. I am only familiar with how it is supplied in the USA. Specifically, I’m familiar with how I receive it in my Botox Practice in Modesto, California, USA. I receive Botox as either a 50U or 100U vial. 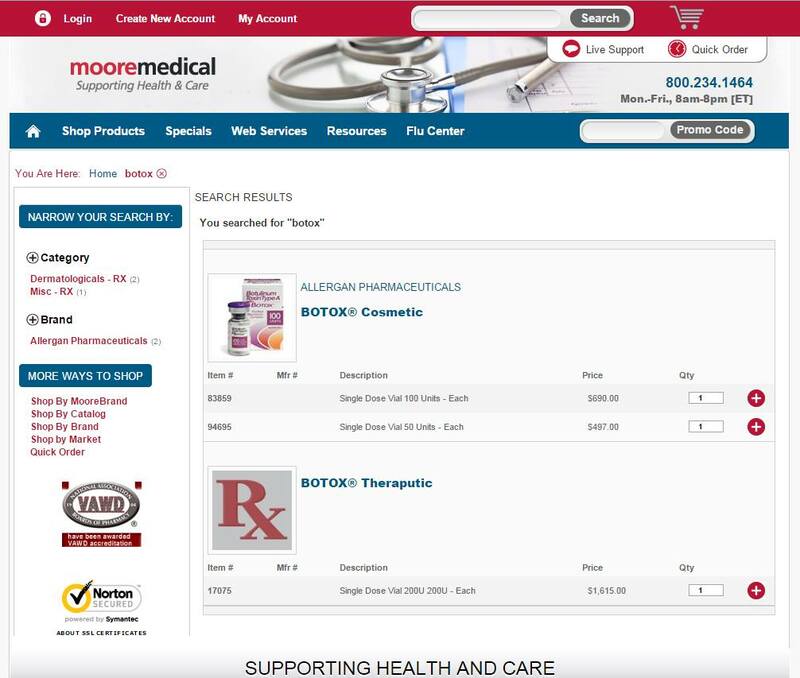 It is sold by Allergan (who also supplies Juvederm), but can also be purchased by several other medical distributors such as McKesson or Moore Medical. 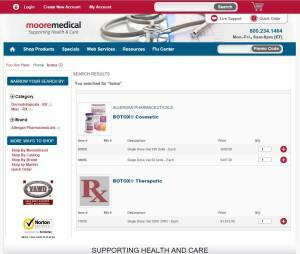 Botox purchased from a Moore Medical Catalog in 2014. It says $690 for a 100U vial and $497 for a 50U vial. 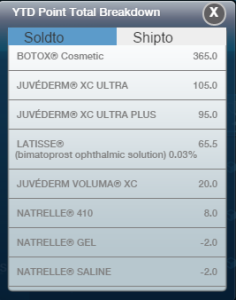 From my experience, the 50U Botox vial costs more than half of the Botox 100U vial. That makes some sense because of excess packaging costs and requirements. 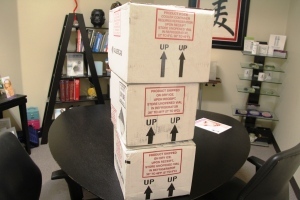 It is shipped in Styrofoam containers on dry ice, and usually I receive it the next day after I’ve ordered the product. And I order directly from Allergan, USA. Botox Delivery. No, it’s not Pizza Delivery. It’s better than Pizza! 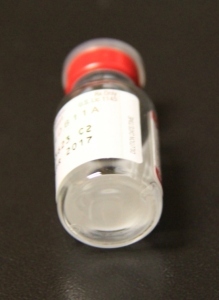 The Botox arrives as dry powder vacuum sealed within the vial. 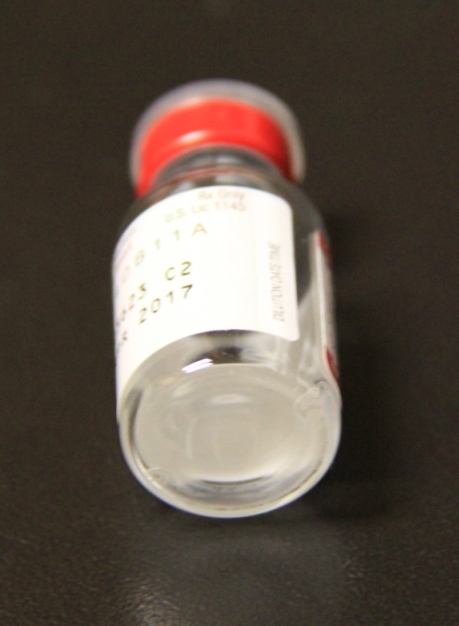 The Botox powder is very fine and it almost looks like a completely empty vial except for some fine Botox dust lining the bottom of the vial. Once obtained in the office, we immediately place it in our specially designated Botox refridgerator which is temperature monitored. Please consult your own physician about any of the topics above. Here’s a listing of about 40 places to get Botox in Modesto. The general public cannot purchase Botox for any of the suppliers mentioned above. Can we undo the effects of Botox? Unlike hyaluronic acid fillers such as Juvederm, Botox cannot be reversed by injecting another agent into the same area. Like using fire to fight fire. Well, probably more effective than that. Botox injected in other parts of the muscle or an opposing muscle might lessen the undesirable original Botox effect. But sometimes, Botox effects can be offset by additional injections of Botox into the opposing muscle (antagonistic muscle). Most of the structures in our body are affected by muscles on a push and pull balance. Botox affects that balance, but we can again re-establish a new balance point by working on the opposing muscle. However Botox only works to relax a muscle. For example if an eyebrow looks like it has dropped, then we can further inject Botox in the muscles which normally depress the eyebrow such as the corrugator muscle or the obicularis oculi muscle – this could help spring the eyebrows back up. Another way to help with Botox problems is the consider relaxing other parts of the same muscle. Sometimes we get a particular “surprised” look in the eyebrows with Botox. This is the look where the eyebrows on the side go way up when we try to raise the eyebrow. Sometimes this is called the “M” look or the “Spock” look and there are other names to this such as the “Mephisto” look. I think the Spock look explains it quite well – with the pointed eyebrows. This is usually caused by an unequal weakening for the frontalis muscle (forehead muscle) at the central component of this muscle. When the central part of the frontalis muslce is weaker the lateral part tries to compensate by becoming eve more active. We can compensate for this by injecting the lateral parts of the frontalis muscle with more Botox. What about eye drops for lid ptosis (droop)? If there is a eyelid droop, there are certain medications that can help the lid raise. But there are other side effects associated with this technique. I hope to come back to this topic in another blog. With time, Botox effects wear off. Fortunately some of the ill-effects of Botox are due to drifting of small quantities of the injected Botox. Thus a few weeks might be all it takes for some of the effects to wear off. This info isn’t meant as some sort of personalized medical advice. Please see your Botox doctor or injector in person to have a discussion regarding Botox and any need for Botox correction. All the topics mentioned here is considered off label FDA usage of Botox. My Botox practice is in Modesto, CA. I respect Botox injections as challenging procedures. I’ve had my share of Botox problems and need for corrective Botox solutions. I look at each of these Botox problems as an opportunity to improve for my Modesto, California patients. Driving through the first few minutes of the Modesto Sparkles Car Wash on Coffee Road. It’s in the northern part of Modesto, and it has a PET WASH component too. I just got this Patriot CT7 camera made in Taiwan, and this is the first video that I’ve processed. I think this is like a Go Pro camera, but I’m not sure, because I’ve never owned a Go Pro camera. This is my first day with this Patriot CT7 camera, and I just noticed that there is a date/time stamp which I hadn’t set yet – thus the date and time is wrong. For fun, I’m sharing this on YouTube. Background music is Chopin’s Minute Waltz which I played a few months ago. I’ve been having this obsession with Chopin. I’m still working on improving upon it and I actually feel that it getting better – still. I work in Modesto, CA as a BOTOX injector, acupuncturist, and surgeon. 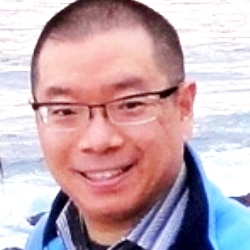 I assist in many plastic surgical procedures with my wife, Dr. Tammy Wu, Board Certified Plastic Surgeon. I have always valued accurate, precise, deliberate dexterity. Typing is one of those things that demands a certain amount of dexterity. I got a Christmas gift from a relative when I was probably around 9 years old; it was a how-to-type book. I remember devouring that book up with our family’s type-writer in the basement. Yes, an old fashioned type-writer. The keys got stuck, and I used much ink practicing every page in that book. I think it was one of the best gifts and best memories. Today, I want to thank my relatives for that awesome gift about 35 Christmases ago. I think it helped lead me to a life where dexterity was of utmost importance – especially as a surgeon and Botox injector. If I could make excuses, for the result above (121 words per minute) I’m typing on an uneven surface, at an unreasonable height. One of these days, I’ll try to find a stable surface to type upon – or a different keyboard for that matter – one that doesn’t squeak and doesn’t bounce around, and I hope to have an even better result. I believe that the height of my typing speed was back in high school, and it’s been somewhat slowed down on purpose because of respect for carpal tunnel syndrome -which I somewhat suffered from during my Surgery training years. 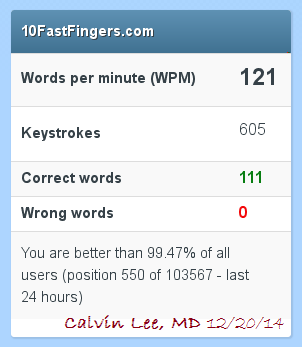 My carpal tunnel is just about gone, but I know part of that was from watching the way I type. So I typed this whole paragraph probably at 100 words per minute which is a relaxed pace for me. Performs surgery and injects Botox in Modesto, California. Disclaimer: Be careful typing. It can cause problems if there is too much strain. There is no medical advice here. How many Botox Units for Crows Feet? How many units of Botox are good for treating the crows feet around the eyes? Quick answer? 8-12 units of Botox per side. Because we usually want to treat both sides of the eyes, we would double that number and that would be 16-24 units. Yes, about 8-12 units of Botox could be injected per crows feet (left or right). However, everyone is different. I have done more and I have done less. This depends on Male vs Female, young vs old, and of course on personal preferences and experiences with Botox. Another consideration is eyebrows. Eyebrows can also be lifted with a certain style of crows feet injection, or even an extension of the crows feet injection. Women and men have different eyebrows. Women have more of an arch, which complements a certain style of crows feet Botox injections – these injections hug the eye a bit closer – especially toward the eyebrow region. And yet another consideration is swelling under the eyes. Sometimes too much injection in the crows feet can lead to temporary swelling under the eyes. These are things to discuss with your personal Botox injector – preferably in person and at an appointment (face-to-face). What to do for really deep Crows Feet lines? Static lines. Fillers may be an option. I like to use Belotero as a filler for crows feet if needed. Juvederm could also be used, but in my hands it tends to be a little bit bumpier. But it is usually my preference to try Botox alone first. That’s the beauty of Botox. It is customizable. Everyone will have different preferences and have a different response to Botox. It becomes a science and art – this injection of Botox. I hope I helped to answer the question of how many units of Botox are needed to help with crows feet around the sides of the eyes. Let’s say we just wanted one number to be the answer. Perhaps hang on to the number 20. It’s a nice round number, and it’s between 16-24 units of Botox (for both sides). I would say that 20 units of Botox is a nice treatment for many people’s crows feet! Please feel free visit our Botox practice in Modesto.